TCO Field Service - Midland, TX. Our goal at TCO Field Service is to provide quality equipment, Personnel, and service at a fair and competitive rate: to each and every customer we serve. We would like to take this opportunity to thank all of our customers for your loyal support in the past and also in the future. Our goal is for our service and personnel and pricing to be our calling card for your business and support. We provide maintenance to the oilfield and also do construction of all types. We have over 80 dedicated people ready to tackle a simple leak, to the largest facility project. Our equipment includes: Gang trucks, Dump trucks, Back hoes, Maintainer, Vacuum truck, Ditchers, Welding trucks, Poly trailers, Pipe trailers. We have a full service welding shop with fire tubes in stock for immediate installation. We also have water legs, crossovers, belt guards and can do quality custom fabrication of any type. 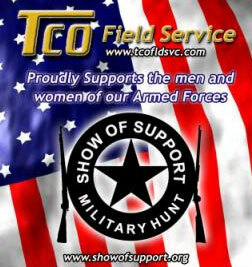 We are a proud sponsor for Show of Support.